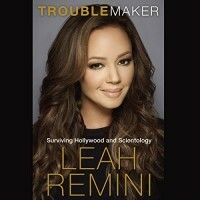 Having pretty much no idea of who Leah Remini is, I still enjoyed listening to this autobiography/scientology-bashing book, which she narrated herself. I am not a religious person, having soured on my Catholic upbringing during my teens. However, I still respect those that choose to believe in Catholicism because it brings them happiness and often provides them support in tough times. I do not have any respect whatsoever for Scientology; I cannot believe that any true religion that is interested in having you better yourself and better the world, would charge you money to do so. And I'm not talking handing around the collection plate and asking you for what you can afford. I'm talking about MAKING YOU PAY, even to the extent of coaching you on how to call Visa and ask them for a larger credit limit, so that you may donate it to the "church." I realize this information is subjective and not necessarily fact. But taken in conjunction with several in depth articles I've read and the few documentaries I've seen, most of Leah's story rang true to me. The reporting on your friends, the constant "sec checks" (security checks to be sure you are not doing anything against "church" tenets or "policy"), the constant classes and levels and the endless donations, donations, donations. These are all things touched upon in various other media which leads me to believe most of it is, indeed, true. I recommend you read, (or listen) to the book, perhaps watch a documentary or two, and come to your own conclusion. If you want, look me up and I'll be happy to discuss it with you. Most especially the thing that irks me the most: Scientology's tax exempt status.